HOW LONG DOES IT TAKE TO GET OVER HEARTACHE? 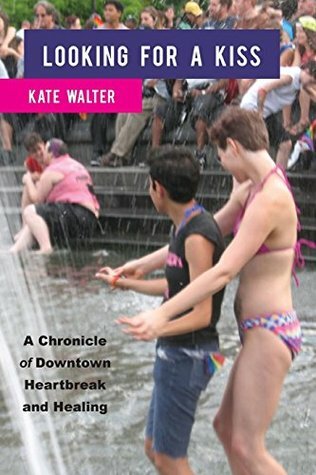 In her debut memoir, Kate Walter-journalist, teacher, and chronicler of Greenwich Village life-explores her recovery from the sudden breakup of her long lesbian relationship. With brave and revealing details, Walter confesses her grief and rage and questions her past choices. Seeking answers and spiritual solace, she joins a gay-positive church, visits psychics, throws herself into yoga and chanting, and starts dating again at 60. Like the urban landscape that serves as her backdrop, Walter's fast-paced dialogue has a raspy realness and soulful edge. She describes loneliness and longing with humorous and poetic prose. Readers are invited to share her journey to a more conscious life-or at least a hot kiss. Let me 1st say that as a card-carrying heterosexual (never mind that I once cried during a Buffy the Vampire Slayer episode - or that I am a huge Broadway musical fan - or that I am the final decision-maker on Joni's outfits - or that The Bachelor/Bachelorette is one of my favorite shows - or...well, you get the idea), I wouldn't automatically pick Looking for a Kiss. But I connected with Kate on Twitter and LinkedIn and told her I would be happy to read her book. And I'm definitely glad I did. This is a very good, very well-written book. And you can talk about gay or straight, but here is a universal truth: Finding love at 60 is tough. 1. The roughly 5-year period that Kate chronicles is well-spaced. It's neither rushed not too drawn out. 3. Kate regularly sees both a therapist and a psychic. It was fun to see what each had to say. Most of the time, they were in sync. There's even one situation where Kate goes to a speed shrinking session. This is like speed dating, only with therapists. 4. I enjoyed reading about how Kate got involved with the spiritual world. She went to a conference hosted by Sonia Choquette. And embraced the Law of Attraction. Since Joni is a Reiki master, I understand the benefits of connecting with your spiritual side. 5. I liked learning about the Middle Collegiate Church in the East Village. Their motto is "Welcoming, Artistic, Inclusive, Bold." The reverend, Dr. Jacqui Lewis, is very cool. 6. I definitely liked learning how a lesbian goes about meeting other lesbians. Many of the "mixers" are the same for gays and straights. But since I've been with Joni for nearly 50 years, any memoir talking about "mixers" and "meet-ups" would hold the same fascination for me. 7. And, of course, there were a few mentions that I could personally relate to; such as High Line Park in New York City, which we've been on twice while visiting Lauren and Joe; and Jersey Boys, which we saw in San Francisco; and East West Books, which we also have in Mt. View. Memoirs are inherently interesting, almost regardless of the subject matter. And this one is no exception. Kate does a very good job of telling her story and making us feel the journey she went on. Since the book ends in 2010, maybe we'll get a sequel that gives us an update. I'll look forward to that.